Described by The New York Times Book Review as “A long, gorgeous epic, full of love and caring…one of the best novels you’ll read this year,” We Are Not Ourselves is a testament to our greatest desires and our greatest frailties. Through the lives of these characters, Thomas charts the story of the American Century. The result is, “stunning…The joys of this book are the joys of any classic work of literature—for that is what this is destined to become—superbly rendered small moments that capture both an individual life and the universality of that person’s experience” (The Washington Post). Matthew Thomas was born in the Bronx and grew up in Queens. A graduate of the University of Chicago, he has an MA from the Writing Seminars at Johns Hopkins University and an MFA from the University of California, Irvine. 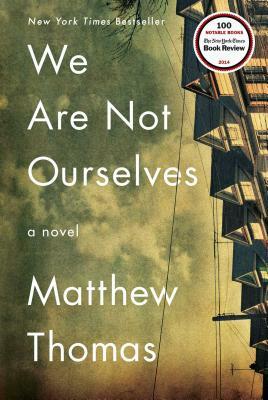 His New York Times-bestselling novel We Are Not Ourselves has been shortlisted for the Flaherty-Dunnan First Novel Prize from the Center for Fiction and longlisted for the Guardian First Book Award. He lives with his wife and twin children in New Jersey. "The mind is a mystery no less than the heart. In We Are Not Ourselves, Matthew Thomas has written a masterwork on both, as well as an anatomy of the American middle class in the 20th Century. It's all here: how we live, how we love, how we die, how we carry on. And Thomas does it with the epic sweep and small pleasures of the very best fiction. It's humbling and heartening to read a book this good." "We Are Not Ourselves is wonderful on the position of the striving classes and our longings on behalf of our families, and on how we deal with unexpected disaster. It’s as fiercely passionate and big-hearted and memorable as Eileen, its I’m-holding-this-family-together-with-my-two-hands protagonist."